I got into freelancing by accident. Almost eleven years ago now, I started a blog (not this one – it took me a couple of attempts to settle on a homebase online). To try to get more readers, I submitted a “guest post” to a much bigger blog. To my delight, they accepted it. And then, out of the blue, they offered me a paying gig, at $20 per (short) blog post. I still remember how surprised, and thrilled, I was to get that email. I’d never thought of freelancing before then: I was working on a novel and my big writing dream was to land a publishing deal. After a few months of freelancing (for that blog and several others), I was able to quit my day job. Ten years on, I’m still freelancing – among lots of other things! – and I still love it. Perhaps like me back then, your focus is on writing novels. Or maybe you’re a poet, or you run a blog of your own. You might have considered freelancing, only to think that it isn’t for you – or it might never have even crossed your mind. One of the great things about freelancing is that it doesn’t need to take up lots of time. With that first freelancing gig, I was writing one short blog post each week – it took me no more than 45 minutes. Some types of writing (like working on a book) require a huge commitment of time before you know whether you’re going to get anywhere. With freelancing, though, you can spend a couple of hours for a few weeks and get a good sense of whether you’ll enjoy it or not. When I started that first blog, I had rather rosy ideas about how quickly and easily I could make money blogging! I’d popped Google Ads on my blog, and like many brand new bloggers, I was hoping to bring in lots of readers and make lots of advertising revenue. It didn’t work out quite how I’d planned … in fact, it took me eleven months of blogging before I made enough ($100) to get my first cheque from Google. As a freelancer, I’ve typically been paid within a couple of weeks of completing each blog post (and often within a couple of days)! Even if it takes a month or two for a particular publication to pay me, it’s still way faster than waiting to rack up advertising revenue on a new blog. It’s also a lot quicker, and far more reliable, than trying to make money from a novel or a non-fiction book. Some writers are put off freelancing by the abysmally low rates advertised on sites like Elance and TextBroker. In the freelancing world, these sites are known as “content mills” – they churn out lots of low-quality content for blogs and websites, and they pay extremely low rates ($5 for a 1,000 word post isn’t uncommon). While these gigs are often the most visible, there are plenty of far better paying roles out there – for blogs, for magazines, and for clients who want website copy or email newsletters written. I’d strongly recommend taking a look at Carol Tice’s excellent blog Make a Living Writing for a reality check about freelancing pay – in particular, 3 Simple Ways to Find Better-Paying Freelance Writing Jobs. Freelancing is a great way to develop your writing skills – whatever your long-term ambitions are. You’ll get used to working with editors (and this can flag up issues or quirks that you might not have noticed in your own writing). You’ll also learn to adapt your style for different audiences and purposes – my posts for Craft Your Content are quite different from my posts for Daily Writing Tips, for instance. Having to finish and turn in work before a deadline can be a very helpful writing discipline, too! You may find that writing regular freelance pieces helps you develop the focus you need in order to work consistently on your personal writing projects. It’s very rare that freelancing needs to be done at a specific time. Normally, you’ll have plenty of flexibility about when you work – and where you work. 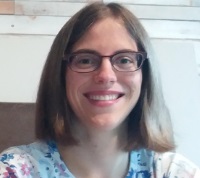 In the past, I’ve written freelance pieces in all sorts of locations: local libraries, coffee shops, my parents’ house when my husband and I were in the middle of a house move. You can write at whatever time of day suits you: I’ve sometimes worked on freelance pieces at 5am before my kids are up, for instance. I’ve also worked occasional weekends in order to take time off midweek. If you find that you focus better at a particular time of day, you can take advantage of that by arranging your freelancing accordingly. Some writers rule out freelancing because they think they won’t be good enough, or that they’ll need to spend ages on a piece in order to get it up to a publishable standard. If you’ve never even tried freelancing, though, how do you know you won’t be good enough? While you’ll definitely need to be able to write fluent prose, no-one’s expecting you to produce literary masterpieces. In fact, for most types of freelancing, writing in a straightforward way is much better. 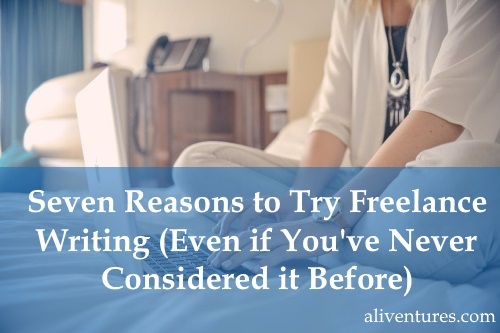 If you’re used to writing fiction (which is much harder than non-fiction), you might find that freelancing feels surprisingly easy. Obviously, one key reason to freelance is for the money! But if you already have a day job, or another source of income, then the money might not be particularly important to you. If that’s the case, you might want to think of freelancing as a way to support other projects until they start to pay off. For instance, you might use your freelancing income to pay for creative writing courses, or to hire an editor for your novel. Alternatively, like me, you might feel that freelancing is a great way to pay the bills while giving you the time (and flexibility) to pursue other writing projects on the side. I wouldn’t want to go back to a full time office job now – I can make more per hour from freelancing, and it has given me the freedom to work on things like my Lycopolis trilogy of novels and my Blogger’s Guides ebooks. 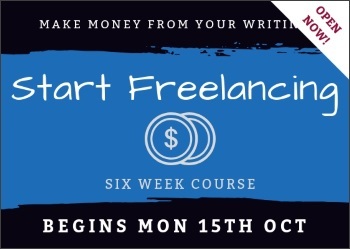 If you’re thinking that freelancing might be worth a second look, check out my upcoming course Start Freelancing. It begins next Monday (15th October), but registration closes this Friday (12th October) so that everyone can settle in before we get underway. The course costs $60 ($10 per week), but if you try it and decide it’s not for you, just email me at any point during the course and I’ll refund you in full. 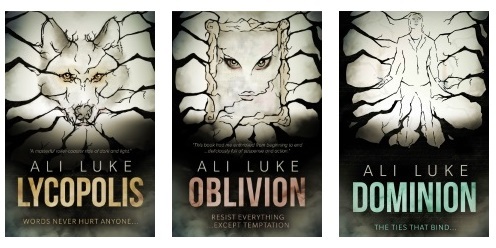 You can find all the details here – but if you have any questions at all, just drop me an email (ali@aliventures.com) and I’ll be very glad to help.